Since the inception of the UK government position of Secretary of State for the Environment in 1970 there have been twenty one holders of the post. Some have been very good, and a few not so good, but of them all, the current incumbent, Owen Paterson, is surely the least suitable for the role. Mr Paterson certainly doesn’t seem to believe that acting as advocate for the environment is part of his remit, as demonstrated through his support for fracking, his loud and enthusiastic support for blood sports, his oversight of the cruel and needless badger cull or more recently, his open support for genetically modified (GM) crops. Up until now, the UK has been – a few small-scale experimental areas aside – a GM-free zone (although some GMOs have slipped into the UK under the radar, in under the guise of animal feedstuff, about which I will write in more detail in a future post). It is clear that this state of affairs reflects the population’s general mistrust and disquiet about genetically modified crops. But Mr Paterson, the supposed political guardian of our environment, has not only enthusiastically embraced the idea of GM foods, he has described those who oppose them as as “evil” and accused them of “casting a dark shadow over attempts to feed the world”. The real truth is that the incipient world food crisis is the result of a commercialised agricultural system that reduces everything to a financial transaction, one which fails to factor in the things we should really care about, such as deforestation, soil erosion and desertification, pollution, poverty, slave labour and transportation. The development of GM foods is simply the latest manifestation of this twisted set of values. If we decide to listen to the Owen Patersons of this world and turn to genetic modification as a “solution” to the emerging world food crisis then we will cut ourselves disastrously adrift from the origin of the food we eat, far more so than we are at present. But we will also have failed in our moral duty to address the real causes of that crisis, one of which is a squalid system of food production and distribution that has managed to leave one billion people on this planet malnourished whilst at the same time another one billion are overweight or obese. We need a government and an Environment Secretary with the vision and courage to speak out about such things. Instead Mr Paterson spends his time banging the drum for rapacious global conglomerates which have pumped billions of pounds into developing and promoting toxic and unsafe products used in food production. These companies straddle international boundaries, have turnovers greater than many countries and are becoming virtually unchallengeable by governments. Cheered on by the likes of Mr Paterson they have done so much to sow the seeds of this nascent world food crisis, and they continue to represent the dangerous, ugly and unsustainable route through which so much of our food reaches our tables. Celeriac is one of my allotment “dependables” at this time of year (alongside kale, chard, spinach, parsnip, Brussels sprouts, purple sprouting broccoli and beetroot), in that it is generally pretty capable of withstanding the winter weather. Whilst it may not be the prettiest of vegetables (which may well explain why Monsanto don’t seem to have attempted to create a GM version yet), it has a pleasant mild, nutty, celery-like taste and is very versatile in the kitchen, where it can be interchanged readily with potatoes. Celeriac also has the advantage over potatoes of having very little starch. Here I’ve used them to make a very simple, healthy, cumin-scented version of oven fries. These are a great accompaniment and equally as good on their own. To enjoy them at their best, serve them immediately after cooking, while they are still hot and crispy. 1. Pre-heat the oven to 200°C (400°F, gas mark 6). Bring a large pan of water to the boil. 2. Peel the celeriac and cut it into sticks 1 cm or smaller in width, according to your preference. Put these celeriac sticks into the boiling water and cook for 2 minutes only. Drain and leave for a minute to let the steam rise off. 2. Put the drained celeriac chips carefully into a bowl. Pour over the olive oil then toss very gently to ensure the celeriac sticks are all coated. Spread the chips on a shallow baking tray and sprinkle half the cumin over them evenly. Put the baking tray into the preheated oven for 20 minutes, then gently turn the celeriac fries over and sprinkle with the remaining cumin. Leave in the oven for a further 15-20 minutes or until they are crisp and golden brown all over. Drain briefly on kitchen paper and then serve. Your celeriac chips look delicious Steve – proper, healthy food and I bet they tasted all the better for the connection you had with their very natural production. I could do with some tips on growing celeriac – only tried once and the roots were pretty tiny. Tasty but not a lot to eat! Do you think the soil I grew them in just needed more organic matter or is there anything specific you do when growing them? Hi Andrea and thanks for your comments. The celeriac chips were indeed very tasty. In my experience celeriac can be quite an unpredictable crop – I’ve had both good and bad years and I don’t really know why. The variety I grew most recently is called Prinz, which certainly did very well for me this last year. I am slowly trying to build up a rich, organic soil in the raised beds on my allotment plot and the plants do seem to do well in a richer soil. The only other thing I’ve picked up about celeriac is will really struggle in prolonged periods of hot weather (such as we enjoyed last summer) unless it is regularly very well watered. The roots should never be allowed to dry out. Hope that helps. I’m almost (only almost!) tempted to try growing celeriac again on the basis of your recipe – my first go was a complete disaster, but if they be used can make fries for with ketchup and salt… As for GM foods -much of their PR problem seems to lie with the fact that they’re ‘owned’ by the big agrochemical companies, and appear to have been developed to sell more pesticides. Maybe if a government funded research project developed a GM crop which benefited the growers rather than the multi-nationals, we’d look on them more favourably? 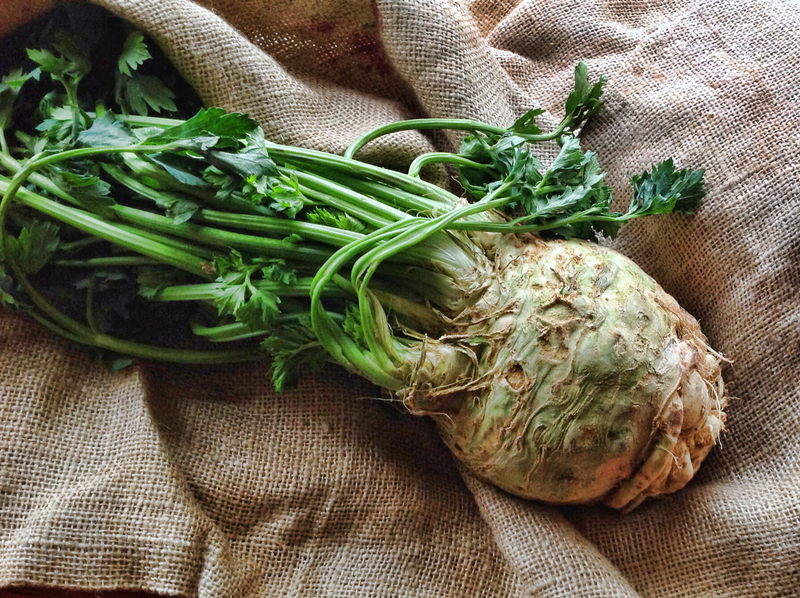 I hope you give celeriac another chance, I do think it is worth the trouble. Once you get past the first frosts, and provided you keep it well watered, it is one of those wonderful group of crops that will just sit in the ground until you need it, usually right through to the end of March. As you will have gathered, I am strongly opposed to the use of genetic modification in the food we grow and eat, and that view applies whether the process is in the hands of a benign government or an unaccountable and secretive global corporation. Genetic engineering is a science that is in its infancy. One of the problems with the genetic modification of crops, apart from the fact that it is completely unnecessary, is that the process is irreversible – once they are out there, GMOs will begin to contaminate the gene pool. Genetic modification also takes away from the farmer and the grower the ownership of the process of seed production, a natural process that has served us well for thousands of years. Why should we want to give that up?